I was working on a Polycom VVX configuration file recently and it took me a while to find where the timezone cities were defined: all I had was a mysterious integer. I found them in the PDF “3725-49078-018a-uc-software-skype-for-business-deployment-guide-5-6-0.pdf” but for future reference I decided to copy and re-post them here. There is however a slight problem here – probably several. 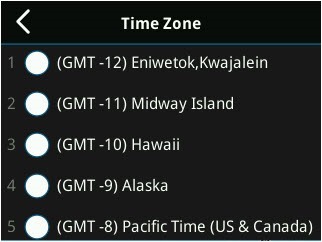 First is that my adopted hometown and Brisbane don’t share the same time-zone, but more importantly the list in the PDF differs from what the phone reports by one – the phone starts with Eniwetok,Kwajalein as entry 1, however the PDF lists these small islands in the Pacific as per the list below. You’ll also note that the XML snippet above (from my own provisioning server & config file) shows Sydney as 113, but the phone reports it as 114. *Disregard* the number in the phone – the PDF is correct & aligns with the cfg file. I expect this will be corrected for in a future update. [Note the f/w version being referenced here is 5.6.0.17325]. BTW, to view the current Time Zone in the phone, the shortcut is Settings / 1-Basic / 1-Preferences / 3-Time and Date / 4-Time Zone. 24th October 2017: This is the initial post. Hi, I am a little confused as to how Polycom have Sydney and Brisbane in the same timezone? So currently if we are in Sydney should we be choosing Melbourne as the time zone? Any ideas? Yes, that’s probably the most logical conclusion. Hi, Thanks for your post. We have the same issue in the most current firmware. Looks like it has not been resolved yet. Which setting did you end up choosing for Brisbane (Sydney,Brisbane).